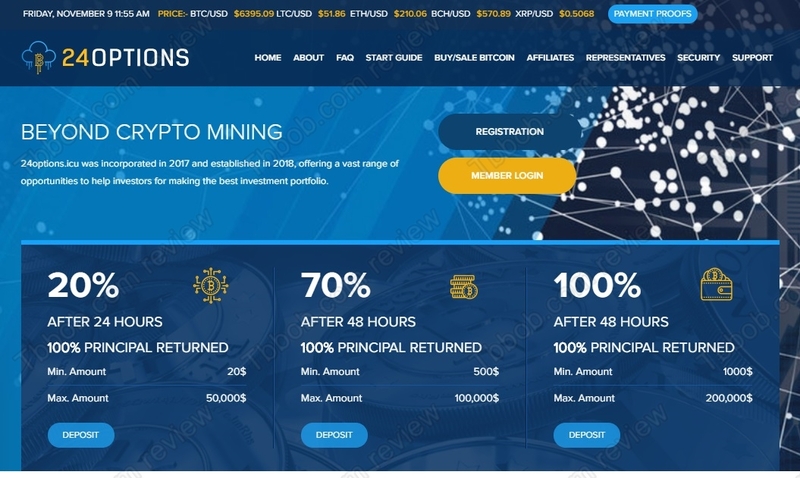 24options is offering investment service, it allegedly makes money in investing in crypto projects and you can reap the rewards. 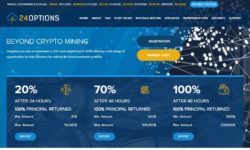 There are three investment plans with up to 100% after two days. So, can you make 1500% per month with 24options? First of all, 24options is obviously very close to 24option, which is a real and regulated broker. The problem is that 24options has nothing to do 24option, they are just trying to abuse the identity of a real company. Secondly, 1500% per month is so ridiculous, that everyone should know that it is a scam. Be it a Ponzi scheme or a simple scam, you should not even consider investing money with 24options. The problem with the name mentioned above clearly translated into problems with the UK tax registration, because the official name is Options Plus 24. UK authorities obviously denied the registration of a name that is too close to another company. Anyway, the important thing is that Options Plus 24 is not registered with the FCA, therefore it is not authorized to provide investment services. 24options therefore is an illegal operation. 24options is a scam, there is no real trading going on, just an illegal financial game. Stay away from it. If you want to make money in crypto trading, start learning on a free demo with a real and regulated broker. Be advised that trading is risk, you can make, but also lose money, so be careful.